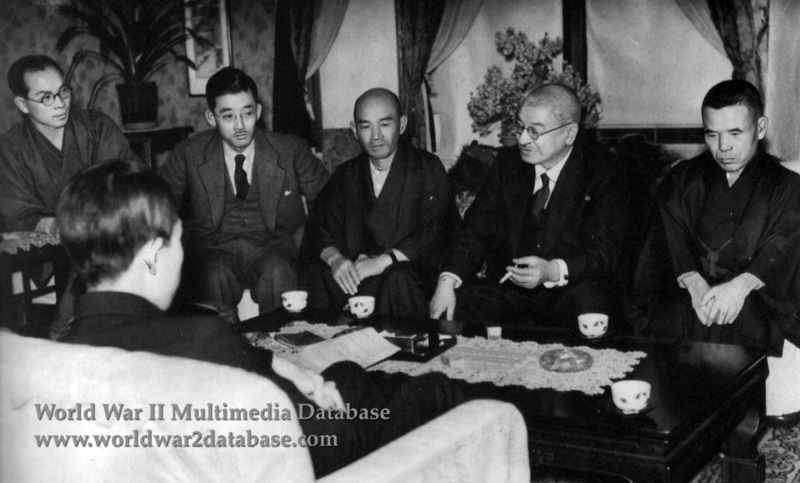 Organization President Nobuyuki Abe meets in his home with the staff of the Taisei Yokusankai (Imperial Rule Assistance Association) to plan their radio broadcast to 140,000 member organizations in support of their candidates. All political parties were required to join the Taisei Yokusankai in 1940 and left-wing, communist, and anti-war parties and politicians were banned from holding office. In 1941 the Tohokai (Society of the Far East) broke away, claiming a far-right stance against the Taisei Yokusankai. With the backing of the Japanese military the Taisei Yokusankai won 80% of the seats in the Diet. Tohokai was humiliated and its leader, Nakano Seigo, committed suicide in mysterious circumstances in October 1943 after being arrested on charges of plotting to overthrow the Tojo government. The 1942 general election was the last during the war. The militarists were given legislative support for their control of the government, and further elections were suspended. Both the Taisei Yokusankai and the Tohokai were banned during the occupation after the war, but the Tohokai has recently resurfaced as the National Socialist Japanese Workers and Welfare Party.